DELTA is well-known across campus for providing instructional technology support to faculty. But did you know that DELTA also serves graduate students? Well, now you do! Explore these key resources and reach out to us with any questions. Each semester, DELTA offers classes on a wide range of topics, from technical “how to” workshops to seminars about emerging issues in higher education and good teaching practices for blended and online courses. Graduate students are welcome to participate in all our courses and can register online at delta.ncsu.edu/workshops. And to keep up with our latest news, subscribe to our listserv. 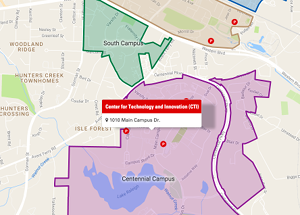 At the beginning of the semester, we offer Teaching with Technology Open Labs. Graduate students who are teaching or assisting with a course can attend and get personalized help from a team of DELTA staff, just when it’s most crucial. We meet with graduate students regularly through our “instructional consultation” service. This service provides in-depth, one-on-one assistance with instructional design, teaching strategies, accessibility, course redesign or incorporating new learning tools into your course. You can come to our office, we can go to you or we can meet via phone or web conference. Request a consultation by filling out our online form and we’ll be in touch with you shortly to arrange a time. If you need immediate teaching support with the learning technologies we have on campus (WolfWare, Moodle or Collaborate, for example) we are here to help you! Our LearnTech Help Desk responds to calls from graduate students as well as faculty and staff. You can call (919.513.7094) or email us and we’ll do our best to solve your problem quickly and completely.